professional wrestler , actor , and hip hop musician John Cena . It is the current entrance theme Cena uses as he makes his entrance to the ring. Currently wrestling for WWE, Cena recorded the song in 2005 for his debut studio album, You Can't See Me . 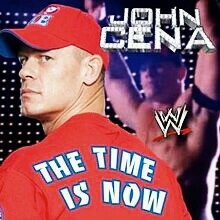 "The Time Is Now" was composed by Cena along with Marc Predka, Cena's cousin known by his stage name Tha Trademarc . Having recorded the album with Cena, Predka was featured on virtually every track of the album. Production was handled by Jake One .